The optimal schedule of docetaxel chemotherapy for castration-resistant prostate cancer is unknown, although continuous administration is accepted as the standard. However, several disadvantages, including side effects, costs, and development of resistant clones, need to be considered during continuous administration of docetaxel. Intermittent docetaxel therapy represents an appealing option to address these issues. Previous studies have reported that intermittent docetaxel therapy is associated with favorable outcomes, with successful chemotherapy holidays and maintained Quality of Life (QOL). However, limitations of these studies include a wide variation in study design and schedule and a lack of randomized trials comprising a large number of patients allowing comparison of outcomes with continuous administration. 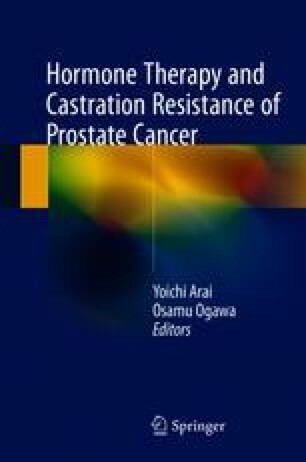 This chapter summarizes current data on intermittent docetaxel therapy in androgen-independent and castration-resistant prostate cancer from previous literature and examines future directions regarding the use of this strategy as a therapeutic option for advanced prostate cancer.